If there are two adjectives that best describe the respective target lists of Democrats and Republicans in the House this cycle, it's “potential” for the donkeys and “predictable” for the elephants. For Democrats, the House map offers a number of potentially enticing targets, many of whom are unaccustomed to serious challenges. Sifting through these possible challenges and finding the favorable matchups is vital to the unlikely Democratic quest to net the 17 seats they need to win back a House majority. For Republicans, the targets are more familiar: They want to finish the job against several Democrats they were unable to defeat in the past two cycles, and reclaim some of the seats they lost in 2012. Doing so in just a handful of districts would probably ensure the reelection of a Republican House speaker 23 months from now. 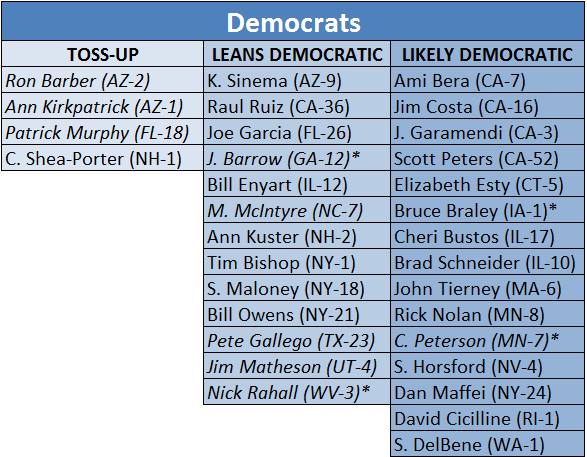 Charts 1 and 2 below show our debut House ratings for the 2014 cycle; the charts feature a total of 69 members -- 32 Democrats and 37 Republicans -- we see as at least potentially vulnerable right now. Notes: Members in italics hold seats that the other party's presidential candidate won in 2012; nine Democrats hold seats won by Mitt Romney, and 16 Republicans hold seats won by Barack Obama. All nine Democrats are listed here; 13 of the 16 Republicans also make this list. The Republicans not listed are Reps. Erik Paulsen (MN), Ileana Ros-Lehtinen (FL) and Dave Reichert (WA). *Signifies possible retirements or candidacies for other offices; **signals candidates vulnerable to primary challenge. Source: Data on presidential results by congressional district from Daily Kos Elections 1 and Crystal Ball research. This list includes just 16% (69 of 435) of all House seats, and those listed as “likely” are only vaguely competitive at this point. 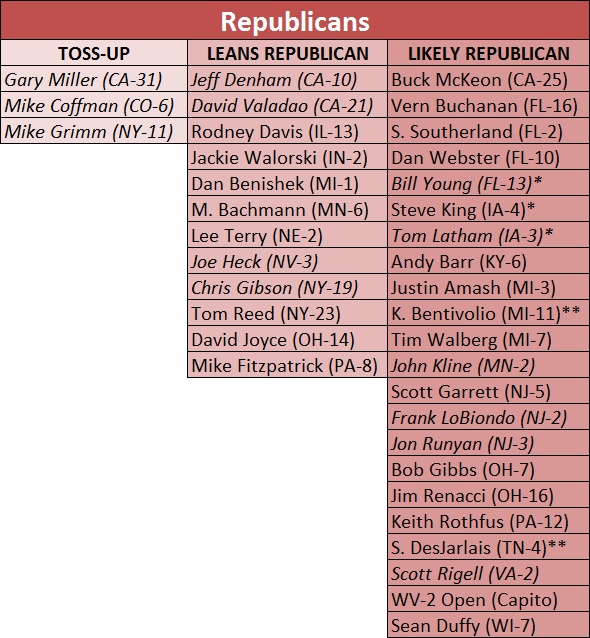 Let's ignore those for the moment and focus on the 17 Democrats and 15 Republicans listed in the “toss-up” or “leans” columns: These are the prime pickup opportunities, and they help inform the “potential” and “predictable” nature of the parties' respective target lists. One way to measure the competitiveness of a House district is to look at the outside spending; that indicates whether national groups, such as the Democratic Congressional Campaign Committee or its counterpart, the National Republican Congressional Committee, see the district as worth targeting to either capture or defend it. Nearly all of the Democratic-held leaning and toss-up seats (16 of 17) saw at least $1 million in outside spending last cycle, according to the Center for Responsive Politics' OpenSecrets.org 2 (68 total races cleared the $1 million in outside spending threshold). Meanwhile, only eight of the 15 toss-up or leaning Republican-held seats saw $1 million or more of outside spending. So while majority Republicans are going back to well-trodden ground in search of targets, minority Democrats are seeking to expand the playing field. The Republican battle plan zeroes in on the italicized names in the above chart who hold Republican-leaning districts; in particular, they will again attempt to defeat some persistently crafty opponents, such as Reps. John Barrow (D, GA-12), Mike McIntyre (D, NC-7) and Jim Matheson (D, UT-4). It's even possible that the latter two districts will feature rematches, with Saratoga Springs Mayor (and featured 2012 Republican convention speaker) Mia Love (R) again taking on Matheson and ex-state Sen. David Rouzer (R) giving it another go against McIntyre. Republicans might prefer new blood, though -- Obama didn't crack 40% of the vote in either of these districts, which speaks to the strength of the incumbents but also, perhaps, to the weakness of their challengers. National Democrats, meanwhile, will focus at least some attention on races that didn't really catch their eye until Election Night last year. Several Republicans listed in the “leans” column had some surprisingly close calls in districts that did not appear to be all that competitive in the run-up to the election. Reps. Michele Bachmann (R, MN-6), Tom Reed (R, NY-23), Lee Terry (R, NE-2) and Jackie Walorski (R, IN-2) only won by an average of two percentage points. The DCCC didn't spend a dime in three of these four races and made only a small, roughly $40,000 investment in the fourth (IN-2). These may become top national Democratic targets in 2014. Most vulnerable Democrat: Patrick Murphy (D, FL-18) -- Murphy's victory over Tea Party-favorite Allen West (R) still seems remarkable, given that Mitt Romney actually won the district. That speaks to West's immense liabilities; a different Republican could make Murphy a one-termer given that he too has his own liabilities 3. Runner-up: Ron Barber (D, AZ-2) -- Barber, who took this seat after the resignation of his former boss, Gabrielle Giffords, faced a surprisingly tough challenge from ex-Air Force pilot Martha McSally in 2012. McSally might run again, which would again put Barber in a tough spot. Barber edges out fellow Arizonan Rep. Ann Kirkpatrick for this (dubious) honor because he had a closer race in 2012 (Barber won by less than a point, while Kirkpatrick won by about 3.5 points). But both are highly vulnerable. Most vulnerable Republican: Gary Miller (R, CA-31) -- The great fluke winner of 2012 -- he defeated a fellow Republican in the general election after the Democratic challenger, Redlands Mayor Pete Aguilar, finished third in the Golden State's then-new top two primary system -- Miller holds the most Democratic district currently represented by a Republican. Aguilar might run again, and any competent Democrat who advances to the general election against Miller will probably be a favorite. Runner-up: Mike Coffman (R, CO-6) -- After making several gaffes 4 last cycle that don't really fit this moderate Colorado district, Coffman -- a narrow 2012 winner -- is likely to face a strong opponent in declared candidate 5 and former state House Speaker Andrew Romanoff (D). Other credible Democrats are also considering the race. Possible retirement that Democrats dread: Collin Peterson (D, MN-7) -- Despite occupying a fairly Republican district, the moderate Peterson hasn't faced a truly tough challenge in years. If the entrenched incumbent hung up his spurs, though, this district would tilt toward the Republicans. Runner-up (tie): John Barrow (D, GA-12) and Nick Rahall (D, WV-3) -- It's possible that both Barrow and Rahall will mount uphill bids for open Senate seats (Rahall looks likelier to jump in at this moment than Barrow). If their House seats became open it's difficult to see how the Democrats could hold them. Possible retirement that Republicans dread: Bill Young (R, FL-13) -- Democrats specifically targeted Young almost the second after the 2012 elections ended, surely as a way to pressure the longest-serving House Republican to step aside (Republicans have done the same with Peterson). If Young runs, he's probably fine, even though his 58% victory in 2012 was the second-smallest of his 22 general election victories; if he doesn't, the seat -- which President Obama narrowly won -- would probably be a toss-up. Runner-up: Ileana Ros-Lehtinen (FL-27) -- Notice that Ros-Lehtinen isn't even listed on the competitive race chart; that's because she's probably unbeatable if she runs. But if she were to retire, the seat would skyrocket to the top of the Democrats' list of targets, given that Obama did better in this district than he did nationally. Ros-Lehtinen, serving her 12th term, is only 60 -- much younger than the octogenarian Young, and thus seemingly less likely to retire -- though she just lost her chairmanship of the House Foreign Affairs Committee because of GOP term limits. Bad 2012 investment worth ignoring (DCCC): Bill Johnson (R, OH-6) -- Remember, above, how some Democratic candidates came achingly close to winning several seats where the DCCC hardly spent any money? Those candidates certainly could have used the $2 million spent trying to defeat Johnson, who ended up winning a second term by 6.5 points in this reddening district along the Ohio River. This is a district where Democrats might again compete, but probably not in the age of Obama given his immense unpopularity in Appalachia. Granted, Obama won't be on the ballot, but his shadow looms large in this region. Bad 2012 investment worth ignoring (NRCC): Jerry McNerney (CA-9) -- National Republicans explored dislodging several Democratic Golden State incumbents, but they spent the most -- nearly $2.5 million -- against McNerney, who ended up winning by 11 points. The GOP could once again target California, hoping for a backlash that could win them back some of the four net seats they lost there in 2012, but the Republican brand is just plain lousy in diverse, liberal California. In his accompanying piece this week, Crystal Ball senior columnist Alan Abramowitz notes the early Democratic edge on the generic congressional ballot 6 and that it could mean modest Democratic House gains. But it's worth noting that Democrats also had a lead in the generic ballot at this point in the 2010 cycle 7, and we all know how that turned out -- the Democrats' generic ballot lead could just reflect an afterglow from the election. Or it could mean something more, given the weakness of the Republican brand nationally 8. Notes: *The House expanded its membership in 1902, so while Teddy Roosevelt's Republicans added seats, the Democrats actually added more, thus gaining ground in the House. Franklin Roosevelt is the only president who presided over three midterms; his Democrats lost 45 House seats in 1942. Source: Vital Statistics on American Politics 2011-2012. 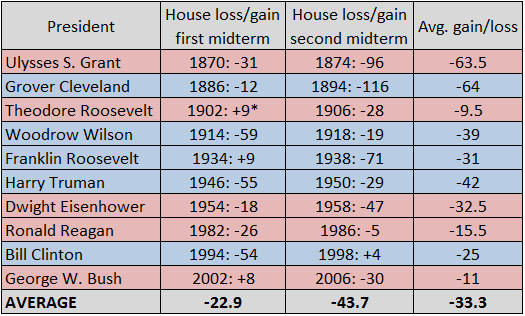 For what it's worth, the averages tell us that while the incumbent president's party almost always loses seats in a midterm, the second midterm is on average worse than the first for these two-term presidents. But looking at these individual elections, there were major national factors at work. For instance, poor economies contributed to huge losses for the incumbent president's party in 1894, 1938, 1946 and 1958, to name just a few examples. Terrorism and wars abroad boosted George W. Bush's Republicans in 2002 and harmed them in 2006. The Republican/Bull Moose split in 1912 delivered Democrat Woodrow Wilson the White House in 1912; a lack of such a split in 1914 undoubtedly helped Republicans make their big House gains. In other words, the incumbent president's party does seem to be at a persistent disadvantage in midterm elections, but the national mood and events can determine the extent of the handicap -- or whether there's a handicap at all. The events that will drive the 2014 election are, obviously, still a mystery, and therefore one cannot rule out or rule in any range of possibilities in the next House cycle. But as Abramowitz notes, the sheer lack of crossover districts -- just 6% of all House members occupy a district won by the other party's presidential nominee -- makes it likelier that we'll only see incremental movement in the House. Stability would be the Republicans' friend, given their existing majority.